The slots of Lightning Box are still a bit underexposed at SuperBigWin. This slots provider focuses on both the online casino market and the land-based market, and quite successfully so. Especially their Stellar Jackpots slots like Chili Gold x 2 and More Monkeys are very popular. So it’s high time to take a closer look at their slots to see how they work, what you can win and whether you can cash out some decent coin. 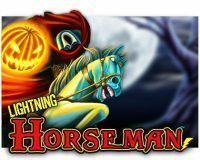 Lightning Horseman is a slot somewhat inspired by the legend of Sleepy Hollow: the story in which a decapitated British horseman travels through time. There is a main Jackpot of $€ 62,500 when you put in the maximum bet, and you also win the Lightning Respin as the main bonus. How does the Lightning Horseman slot work? Lightning Horseman has 5 reels with 4 rows of symbols. There are 40 fixed paylines, with a betting range between $€ 0.40 and $€ 50 per spin. The main prize is the Grand Jackpot, which proportionally increases to the height of the bet. It is always worth 1,250 x the total bet. There are also three smaller jackpots that you can win: the Mini, Minor and Major Jackpot. We estimate the variance of this slot to be medium. The theoretical payout rate is 95.52%. Not very spectacular, especially since the jackpot payouts are also paid out of the bets. The most important symbol(highest paying) is the beheaded horseman: this is a stacked game. It replaces all symbols except the lightning bolts. A full screen of wild symbols yields you 40 x 600 coins, which amounts to 24,000 coins. Compared to the bet, this amounts to 600 x the total bet. The medium symbols consist of a gold box, a mysterious lady, a terrified man, a raven and a barn. A 5-of-a-kind of these symbols is worth between 130 and 300 coins. The low paying symbols consist of the card symbols J, Q, K and A. Spin 5 similar card symbols the for payouts between 20 and 40 coins. If you spin 6 or more lightning bolts in the primary game, you win the Lightning Respins Bonus. You can now try to add as many extra lightning bolts as possible until you fill your screen with a maximum of 15 pieces. You get 3 chances to spin a new lightning bolt, and the counter resets after every new lightning bolt. If you have not spun any new lightning bolts, the balance is drawn up: every lightning bolt will earn you money. If the total stake is less than $€ 2 per spin, fixed cash values apply to the jackpots. Are you able to spin a complete screen full of lightning bolts? Then you win the Flippin’ Retrigger Feature. All symbols are flipped over once more for additional prices. 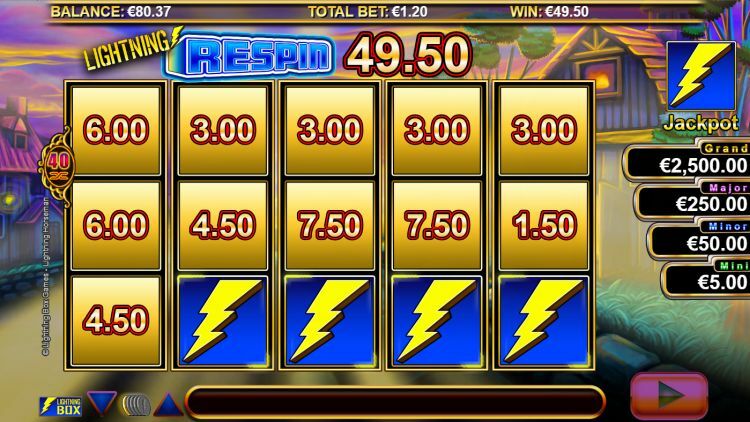 This slot machine is not one of Lightning Box’s best releases. It is hard to pinpoint what is exactly missing, but somehow you feel the slot lacks some depth. We think it is mainly due to the single bonus feature: the Lightning Respins bonus. An extra free spins bonus or mystery feature would have made things a lot more interesting. Visually, it all looks a bit middle of the road and outdated. And then there is the payout rate of 95.52%: nothing to write home about. All in all, Lightning Horseman is a mediocre slot. Where can you find Lightning Horseman? 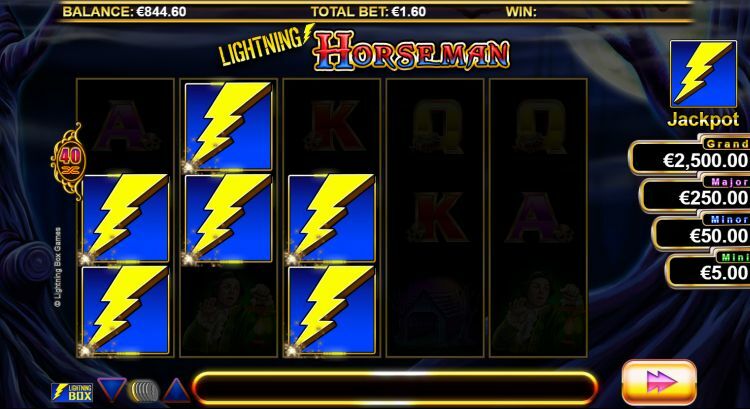 The Lightning Horseman slot is found at all reliable Lightning Box casinos. 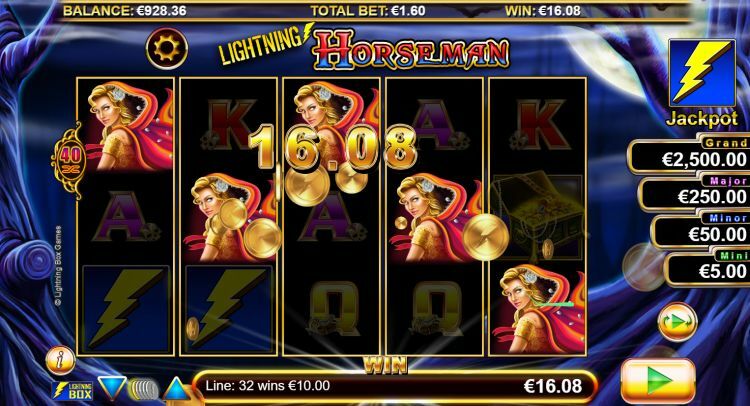 One of these Lightning Box casinos is Casumo, which is one of our favourite online casinos. 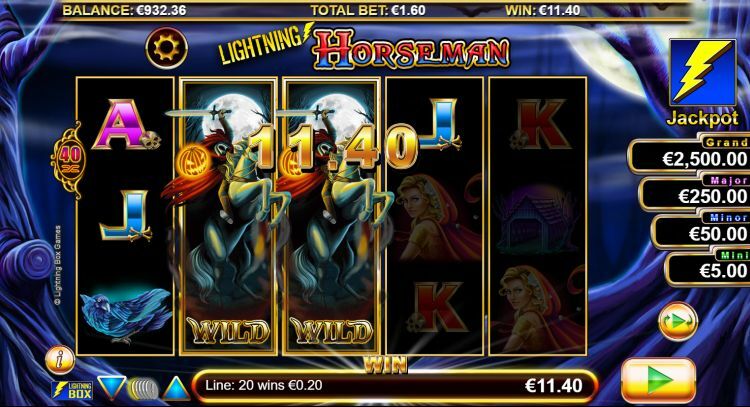 You can play the Lightning Horseman slot at Casumo with a 200% bonus up to $€50 plus 200 free spins.